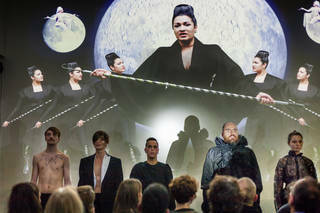 The V&A presents a special evening performance of Kairos by artist and musician Anat Ben-David, a new theatrical song-cycle incorporating fashion, opera, dance, experimental music and multi-media. Inspired by Sadie Plant’s seminal book Zeroes and Ones (1997), Kairos brings together performers from the worlds of opera, electronic and experimental composition, in a futuristic staging by avant-garde fashion studio Boudicca. Responding directly to the architectural environment of The Sainsbury Gallery, Kairos will provide a journey through the new spaces with a series of choreographed sequences. You are invited to join a special evening performance. Kairos will run in three parts, with 2 short intervals. Please note this is a roving performance and seating is limited. Seats will be available on a first come basis; standing places are in the round. The performance will begin at 18.30. Doors will open from 18.10. Entrance will be via the Exhibition Road Quarter entrance.